The major modern and contemporary art galleries like Denise René of Paris are grouped on the ground floor of Hall 2 and this is where we discover kinetic or neo-kinetic works from artists like Elias Crespin. Crespin is a linear artist who literally draws in space. His installations, although numerically controlled, are perfectly timeless. They evoke the architectural drawings that define cities. Decidedly unstable, they slide from order to chaos in slow reconfigurations. Silent, they slow down time for the viewer. Each square steel wire of "Caras 32 ​​in Marco" is diamond shaped and one passes from a front view, at eye level, to a perspective view. The neo-kinetic works of Elias Crespin are part of a continuity in the history of art rife with discoveries that include perspective and innovations such as languages ​​and scripts that, beyond their appearance, drive them. For this Venezuelan living and working in Paris is also an artist of the invisible, an essential component of all works proceeding from a form of illusion. 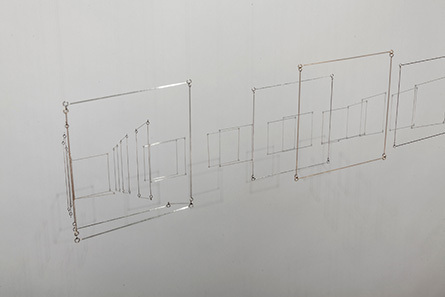 Jeppe Hein, one of the artists exhibited by the Johann König Gallery, presents "Vertical Cut". There is a mirror with a fully reflective surface, except in the centre where it is slit as though by a moving vertical wave. It is precisely this imperfection that makes the art work. Repeated shaking that is lost as it moves away animates the mirror at its centre. Viewers who approach seem to disappear, as though caught in turbulence. One thinks of the scene in Orpheus by the French director Jean Cocteau of passing through the mirror with one major difference. 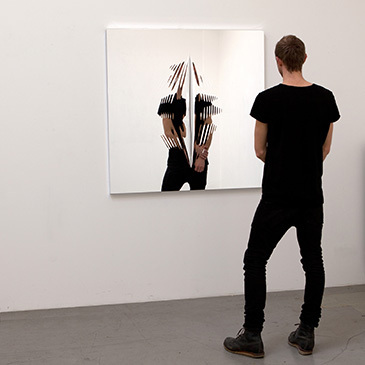 In the 1950 film, the ripples on the surface of the mirror are consistent with the crossing, whereas in the case of the installation of the Danish contemporary artist, they are the origin for the disappearance of spectators. But these, beyond being perturbed, reappear and continue their quest for experience including those for which they will have no memory. Jeppe Hein, through his work interspersed with illusions, encourages us to look beyond the works themselves, to see the world differently. 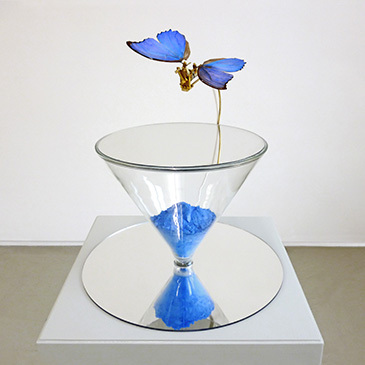 Mechanisms and reflections are also on the stand of the Alice Pauli Gallery of Lausanne, which presented the small piece entitled "Mirrored Butterfly" by Rebecca Horn. It features a butterfly, the interior of whose wings are painted in a similar colour blue to the pigment we see on the other side of the mirror. This insect catches our eye when its wings surreptitiously come alive during a few beats. The apparent fragility of the butterfly is increased by the mechanism that is intermittently activated. This piece in its smallness is a work of intimacy. But it also reflects an elusive form. Because the butterfly's wings seem to stop beating once they have grabbed our attention, causing some frustration. Though the gallery owner reassures us, "they will beat again." They are also elusive by their blue pigment, which in Giotto evokes the divine, without omitting the game of mirrors that makes this piece impossible to perceive in its entirety. Preserving its mystery, right through to the curiosity cabinet of a collector of the strange, the works of this German artist never reveal themselves entirely. There are many galleries such as Konrad Fischer, Koyanagi, Mai 36, Rudiger Schöttle or David Zwirner, who this year have prints of the series "photograms" by Thomas Ruff. The attention of the latter, previously trained in German objective photography by Bernd and Hilla Becher, has recently focused on making photograms. But limited by the size as by the colours, he began by designing a sort of virtual darkroom, a three dimensional space where one can manipulate virtual objects to print surfaces that are virtually sensitive to light. 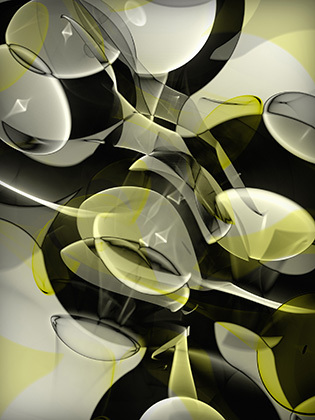 The photograms that are obtained are relatively pictorial evoking cubism with the forms being so elusive. The objects, like those captured by Man Ray and Laszlo Moholy Nagy, have a ghostly presence. There is something that recalls the idea that we are in an era of the invisible initiated by discoveries and developments in science and in art. And what this photographer captures, who was once convinced that objectivity prevailed over other views, goes in that direction. In Basel, there are always a few pieces by Julian Opie such as at the Bob Van Orsouw Gallery with "Jet Stream", or at Lisson Gallery with "People I". The style of the English artist, whether he is working with landscapes or figures, is immediately identifiable. He even has a school if we consider the number of people who post tutorials on the Internet with titles like "Create a Julian Opie Style Portrait." His fascinating stroke is part of a form of reduction that is about getting to the point in removing redundancy in the image. The low resolution of the LED screen "People I" participates greatly in this aesthetic of essentials. The elimination of redundancy, over time, consists of creating loops as short as possible to repeat them endlessly. Which inevitably evokes pre-cinematic devices. The essential with Julian Opie, who questions representation while others question society, is to grab the viewer's attention with simple shapes, hence their universality, through the repetition of movements over time. And it is easy to recognize that it is difficult to take one's eyes off of his works they mesmerize us so much. Galleries such as OMR from Mexico for emerging artists are upstairs in Hall 2 in Basel. This is where Rafael Lozano-Hemmer unveiled his interactive "Nineteen Eighty-Four" installation. Numbers from almost every home in the world have been captured by the cameras of Google Street View, and the Mexican artist living and working in Montreal has isolated them to create a kind of counter. 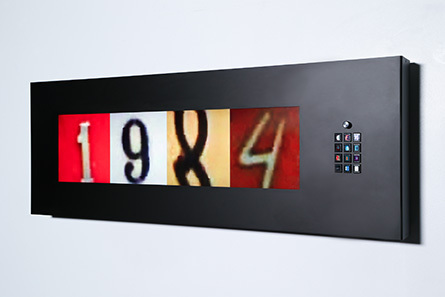 In the image, characters with the most diverse fonts unfold articulating the numbers 1984. When one enters a random number on the keyboard adjacent to the screen, it starts to initiate a count whose outcome is still the year that is the title of George Orwell's famous book. In this book written in 1949, he imagines a world where we are all under surveillance. And it is in such a society that we are now living, without knowing where the boundaries lie between the services that are practical and those that are more invasive. We even take some pleasure in this, documenting our lives much better than the administration of a totalitarian system would, up until we have nothing to hide, or perhaps everything to fear. Hall 1 houses solo shows and other large-scale installations that make up the "Unlimited" program. Harun Farocki's multi-channel installation entitled "Parallel" is presented there by the Thaddaeus Ropac Gallery. This artistic project initiated in 2012 provides an overview of representations of the world belonging to the realm of video games. The artist, through the title of this piece comprised of stages, tells us how very different virtual worlds are. 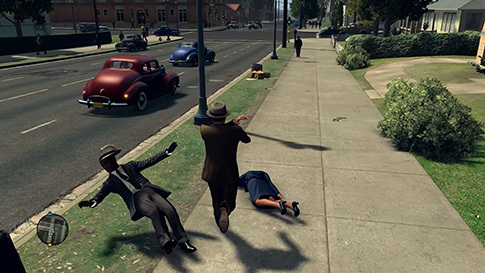 Whether it is through the exaggerated size of pixels from the 1980's, or the strangeness of the characters of Grand Theft Auto, who are without any fear or empathy whatsoever. Today's games are smoother than those of yesterday, but they are no more realistic in the end. Their worlds are finite and wandering about is generally prohibited. Images that synthesize our world, have been, are and always will be calculated by machines to be "played" on other machines. For those who program them, who are too focused on the actions they propose or impose, they sometimes forget the most basic laws of physics or optics. The speech of the artist is therefore critical while the voice over plays with the inherent limitations of parallel worlds by building a narrative around them. Poetry here is poetry by constraint, just as there is a programming by constraint. 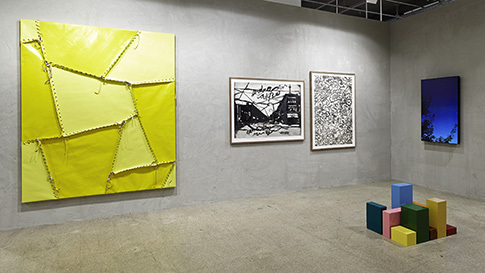 Liste is among the most respected of the alternatives at Art Basel whose branches in Miami as Hong Kong are well known. And it is in the basement of this "small" fair, the other being huge, where you must go to find a global work on the non-commercial booth Haus der Elektronischen Künste Basel or H3K. 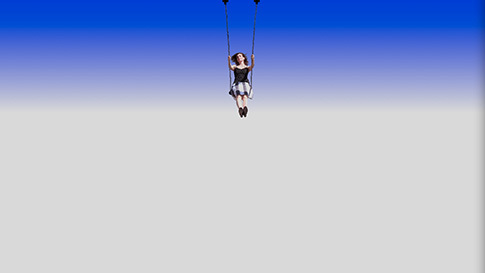 It is a frame-by-frame animation of a young woman on a swing. But each of these frames is hosted on a different server belonging to their artist net friends. This animation loop of twenty-five frames, which is the frequency per second of a video sequence, may be fluid one day. But the jerkiness in the image today tells us that thousands of kilometres are travelled at the speed of light, or almost, so that the carefree young girl may continue to swing. She is swinging via the use of submarine cables and satellite feeds. There is therefore nothing more global than this animation, whose lightness, not to say weightlessness goes against the power and complexity of the technologies implemented. And it is perhaps this "contrast" that qualifies this animation loop entitled Summer and conceived by Olia Lialina as a work of art. Written by Dominique Moulon for Digitalmcd and translated by Geoffrey Finch, July 2014.